Once a week I get a summary of Maria Popova’s delightful site Brain Pickings. 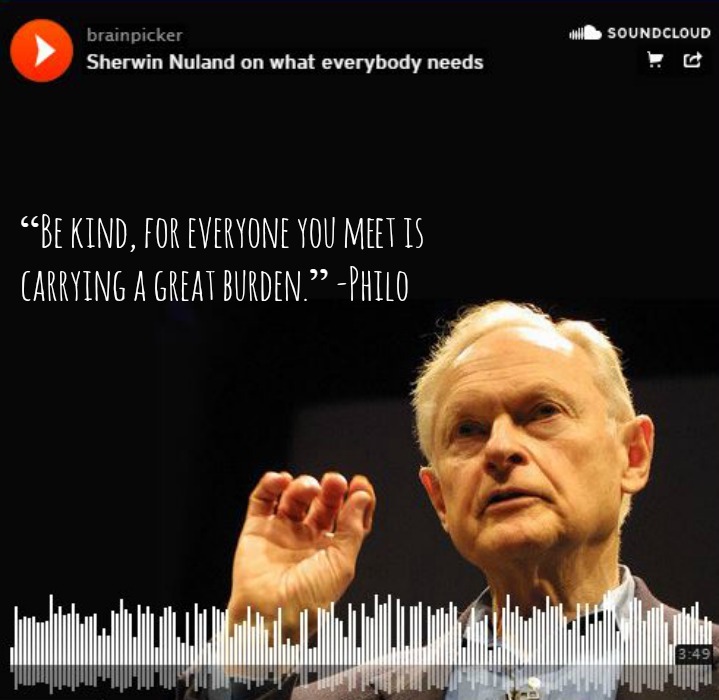 I’ve learned a lot from Brain Pickings over the years, but I sat up when I read this week’s share about Sherwin Nuland. You should read her well written and curated post on Nuland at the Brain Pickings site yourself (and listen to those podcasts, perhaps buy those books) but I wanted to point out a few specifics. When you recognize that pain — and response to pain — is a universal thing, it helps explain so many things about others, just as it explains so much about yourself. It teaches you forbearance. It teaches you a moderation in your responses to other people’s behavior. It teaches you a sort of understanding. It essentially tells you what everybody needs. You know what everybody needs? You want to put it in a single word? And out of that comes every form of love. Posted in Book Shares, Compassion, Human Interaction, Love, Podcast Shares, Questions, Share Your Work, Thoughts, Website SharesTagged Book Recs, Brain Pickings, Compassion, Human Needs, Love, Pain, Podcast, Sherwin Nuland, The Human ConditionBookmark the permalink.